Considered one of the premier sources of blogging news, commentary and information, The Blog Herald has gone through different iterations since its inception in 2003. Among the most successful designs was Brian Gardner‘s grey-themed three-column layout released in 2007. Performancing is releasing this theme as our latest free WordPress theme as the Herald Theme. Sporting a grey-dominant color scheme, with red and blue highlights, the Herald Theme looks clean and crisp, with a wide main content area, and two sidebars to the right. The middle sidebar us wide enough to contain an ad block of 125×125 pixel buttons or a 250×250 banner, and supports featured posts which will display only posts from a defined category or tag. Each sidebar block and footer column can be customized using widgets for easy drag-and-drop rearranging. 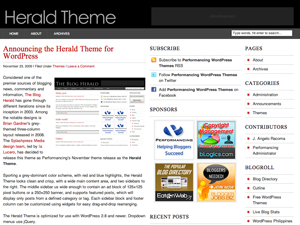 The Herald Theme is optimized for use with WordPress 2.8 and newer. Dropdown menus use jQuery. For a live preview of the theme, click here. To download Herald Theme, click here. ⟵Twitter geotagging: Will you be using the new service? Checked out the Harold theme. Actually there is a nice collection of themes on the page. I especially liked Network WP. At first I thought it was using Flash, but nope. Very nice.